NIN is your friend :nya: . Anyway, the title popped into my mind, and as it turns out NIN has got a nifty little song with those words that expresses the wall's mood quite well. I just love it when things work out so nicely like that :nya: . This wall might be my submission to meteorcloud's contest, I'm still deciding between this one and the one I am currently working on ... fist I've got to finish my little part of a collab though XD . With that said, this would be my first true attempt at a grunge anime wall. The darker underlying theme of the series Angel Sanctuary worked with grunge and I felt that the character Setsuna fit the profile of one who is slowly losing himself or who he thought he once was. I find that many grunge walls use the gold/brown/orange primary coloring and sought to do something with a bit of a different color. I used purple as the primary with minor accents of turquoise, which match the nailed butterflies, and various reds which matched the cross. I modified the coloring of the original image to have more contrast and shadows. Various light effects enhanced the mood and drifting specs can be seen throughtout the wall. Some of the brown parts were parts of the original scan, which I left along to help give more range in color and texture, as such some areas were also removed. Another curious thing about my wall is that I have added various character's faces of the series into the wall drifting along with the purple mass of grunge darkness around him, which actually accomplished quite a creepy effect. See if you can find them all XD . The story of this wall is that of a person trapped within their own mind. Memories swirl about or process through his mind as he ponders on the uncertainty of his future. He has trouble finding and defining who he is and what he truely means to the world. And in these thoughts he becomes lost and slips away. Finally, no I am not dead just slipping away XD . Or not. In any case, all matters regarding the Aspiring Mafia will be patched up so no more poking at me. Don't poke me, because when I intend to do something it will be done. I'll also try to comment on what I can and catch up on all of my members latest submissions tommarrow. Sometimes my life doesn't involve becoming an extension of a computer... so every now and then I may appear to go on a dissappearing spree. Techniques Used: Re-CGing, Brushwork, Stock Photos, Photo-Manips, Light Effects, Smudging, Shading, etc. Reason:The atmosphere and theatrical mood of this wall makes it stand out against many 'indoor' walling styles with it's effective use of lighting. I'm a Happy Camper :nya: ... XD . woa O.o".....that's...a full wallpaper....^_^"....hehe hmz...I dunno what ya done....but...it looks good. effects goes well with the scan. hmz...first grunge ? hmz...not bad for a first grunge ^^ mayB using some weird grunge brushes and textures will give the wall more grunge power. not bad. keep the works! The concept is extremely cool here. The usage of colors and effects matches in a very stylish way. A bit grainy feeling in there but that makes this wall different. About the scan quality...what can I say...amazing.The smudging is impressive. Pretty cool job here Tantaga. One of best walls I ve seen in the past couple of weeks. But damn, this piece sure looks great. You're totally different from us common wallers. I'll be damn if this one doesn't get at least 50+ favs. Sure you can XD . It looks hot and I don't mind admitting it. Very nice work indeed. mhmm.. dunno if its good for a wallie to be so overloaded.. cuz it would make me crazy if I had to look at it too long.. ^_^' mhmm.. I wish i could see the scan, so I would know, where the scan and where the bg is... nyaa..but nonetheless great atmosphere and colours^^ great job! very cool effect's !!! definitly a + favorite... is that a cross... awesome!! well see ya around ^_^! 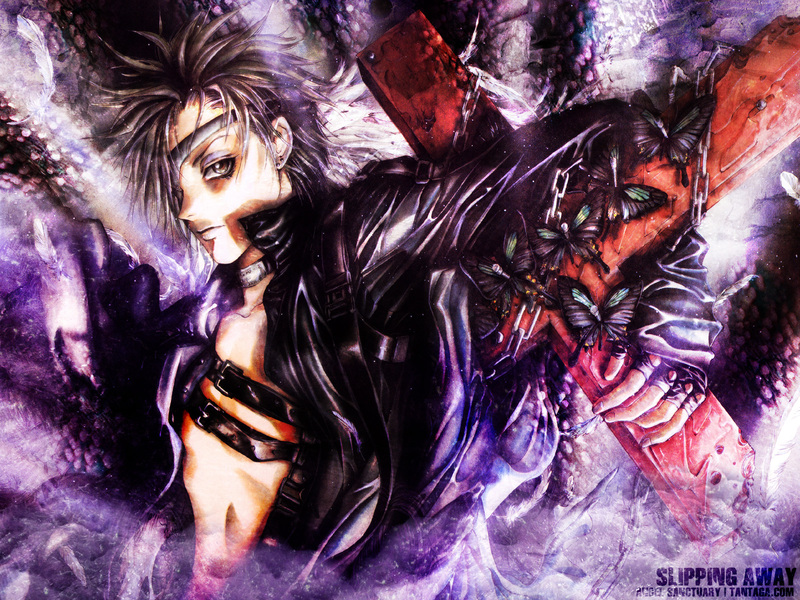 it looks like a cool scan ..
Angel Sanctuary art is always really nice and you just gives justice to it. It's a kind of magical grunge, there's so much light in it. It looks good though. I just love really weird, messy wall like this one. Holy crap, skye, this manga wallie looks so awesome! O__O I can't describe how cool this looks honestly so I'll do my best! It's so neat the way the light grunge texture makes the BG look so classy and the hi-quality style is in a league of it's own! :) Oh yeah, that character looks super badass, I'm kinda intimidated by the way he's looking at me! ^_^' Overall, awesome job skye I wouldn't imagine to see such a talented MT member like yourself! Moving along, this is your first grunge? Not bad! I wish mine turned out this well. >_> Most people don't realize how hard grunge can be, considering finding the right grunge and blending it with the scan. But really, you did an excellent job with the blending. What I'm really impressed with it that you found the right grunge to go with the manga scan. Manga scans are extremely hard to wall in my opinion, just because of their look --- they're hard to match with a BG. But honestly, this grunge/BG and scan looks like they belong together. awwwww........truely beautyful...........tear...... :sweat: :o o_0 What this picture is great what a waist no one, didn't realize your work yet...THE SCOUNDRELZ>>>>>.....!!! One of my absolute favs! I love AS, and the background on this one is great, with the image of Setsuna perfectly. This was set as wallpaper on my pc for ages! That is an AWESOME wallpaper. Very well done!